What does the Huayna Picchu ticket include and does not include? What does the Huayna Picchu ticket include? The ticket Machu Picchu + Huayna Picchu is the only ticket that allows you to ascend to the top of Waynapicchu. This entry is the most desired in the Wonder of the World. It also includes a visit to the Inca City and all its mysterious archaeological sites. What does the ticket Huayna Picchu include? What does each tourist attraction of the ticket Machu Picchu + Huayna Picchu include? Frequently asked questions: what else does the ticket Huayna Picchu include? The Huayna Picchu mountain has an elevation of 2720 m. It is part of the eastern foothills of the Salcantay massif. The Huayna Picchu mountain is a summit located north of the Inca City. It is located next to deep ravines. The adventure of reaching the top is considered one of the most incredible short walks in the world. The Temple of the 3 Windows. All the archaeological attractions of Machu Picchu. The Great Cave or Temple of the Moon. The beautiful landscape at the top of the Waynapicchu. The ticket Huayna Picchu does not include any attraction that is not found in the Inca City or the Waynapicchu mountain. For example, it does not include the ascent to the Machu Picchu mountain or the Manuel Chávez Ballón Site Museum. The train tickets to Aguas Calientes. The buses that lead from Aguas Calientes to the gateway to the Wonder of the World. No type of food or drink. No type of hotel accommodation. The service of the tour guide in the Inca City. No type of mountaineering equipment. The Huayna Picchu mountain – This attraction includes the tour of ancient Inca stairs. There is a very popular part called ‘the stairs of death’. From the top of the summit you can see all the beauty of the Wonder of the World as few can see. 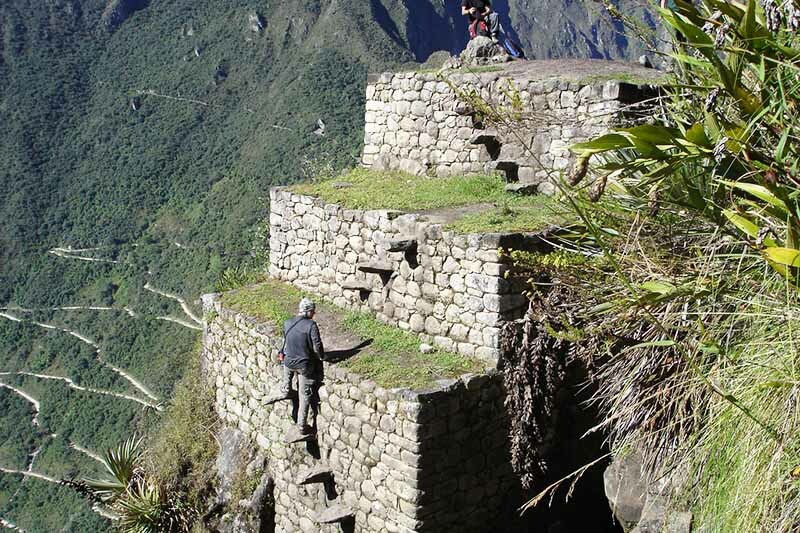 The Temple of the Moon – This Inca site can only be visited with the entrance Machu Picchu + Huayna Picchu. It is built in the middle of a cave in the mountain. It has mysterious structures whose objective is not yet revealed. The Inca City – The most famous buildings of Machu Picchu are there. The tour with a tourist guide is mandatory. They include the Intipunku, the Temple of the Sun, the Intihuatana, the Temple of the Condor, etc. There one can take the postal photos of the Inca site. The postage stamp – Many people want to keep a symbol about their trip to the Inca City. The postage stamp in the passport is a fun symbol of the incredible trip to one of the 7 Wonders of the World. Many tourists queue up just to get this stamp. Does the ticket include the climb to Intipunku? Yes. With this type of ticket you can visit the Inca City and all its tourist attractions. One of them is the Intipunku or the Puerta del Sol. This walk requires a physical effort so it is not recommended to do it along with the ascent to Waynapicchu. Does the walk to the Inca Bridge include? Yes. With this ticket you can take the short walk to the Inca Bridge. This tour takes only 1 hour on average round trip. Yes it is possible to do it together with the ascent to Waynapicchu. Does the ticket include the Inca Trail? No. The Inca Trail is a popular 4-day and 3-night hiking trail. The last day in the morning, the walkers arrive to Machu Picchu through the Puerta del Sol (Intipunku). It is not included in the ticket. Does the entrance include a visit to the Machu Picchu mountain? No. The entrance only includes the entrance to Waynapicchu. To enter the Machu Picchu mountain, you must book the ticket Machu Picchu + Montaña. Does the climb to Putucusi include? The Putucusi is one of the mountains that surround the Wonder of the World. To ascend to the top of this attraction you do not need to buy any type of ticket. Just do it carefully and on your own. This adventure requires special care due to its dangerous trails. Does the entrance to Machu Picchu include admission to the Site Museum? No. To enter the Manuel Chávez Ballón Site Museum, you must purchase the ticket Machu Picchu + Museum. Another option is visiting the cultural site located 15 minutes from the town of Aguas Calientes. Does the ticket include the postal stamp of Machu Picchu? Yes. The postage stamp of Machu Picchu is a nice reminder of the trip to the Wonder of the World. To achieve this, you just have to show the entry and request it in the entrance control of the Inca site. Does the ticket include a visit to Machu Picchu throughout the day? No. The ticket Machu Picchu + Huayna Picchu allows you to stay at the Wonder of the World only until 1 or 2 in the afternoon. To stay all day in the Inca City you must also purchase an entry for the afternoon shift. Entrance to Huayna Picchu is only allowed to people over 12 years old. In Waynapicchu there is a mysterious Inca construction called Temple of the Moon. The only way to get to know it is to enter the Huaynapicchu mountain. The guided tour through Machu Picchu is mandatory. In Huayna Picchu it is not necessary to do the ascent accompanied by an official tour guide. It is recommended to book the ticket Machu Picchu + Huayna Picchu 3 months in advance. Waynapicchu mountain is located 2,720 meters above sea level (msnm) It is known as ‘young mountain’. The ascent to the top is recognized as one of the most incredible short walks in the world.